One of the prominent women poets in Pakistan. Zehra Nigah is an Urdu poet and scriptwriter of Pakistan. She has written several television serials. She was born on 14th May, 1937 in Hyderabad, India and migrated to Pakistan with her parents during the partition in 1947. She belonged to a scholarly family of Hyderabad Deccan. Her father was a civil servant with an interest in poetry. 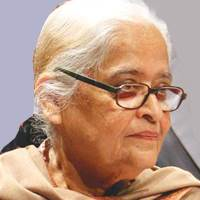 Zehra's elder sister, Surayya Bajia, is also a great drama writer. One of her brothers, Anwar Maqsood, is a versatile satirist and public speaker and another brother, Ahmad Maqsood was Secretary to the Government of Sindh. She married Majid Ali, who was a civil servant and had interest in Sufi poetry. She has also received various awards including Pride of Performance in recognition of her literary works.